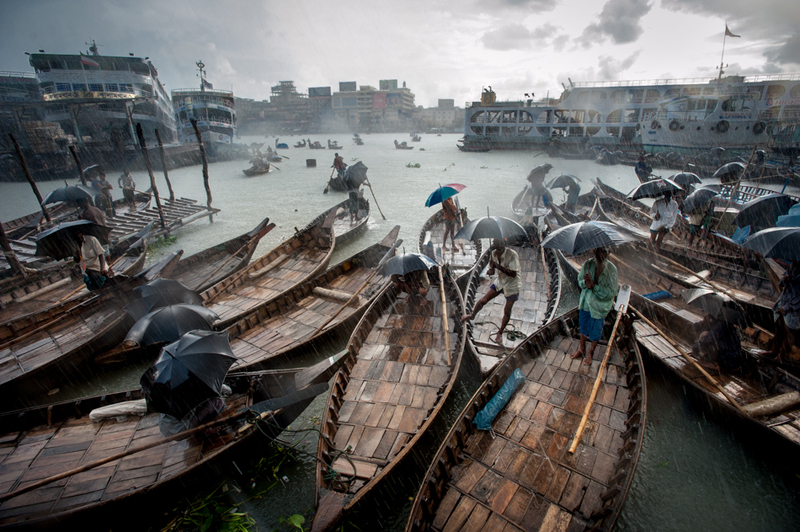 River taxi drivers take shelter during a rain storm in Dhaka, Bangladesh. Part of a story on life in Bangladesh's capital after being voted the worst city in the world to live. I recently gave a series of four presentations to students from Chattanooga State Community College in Tennessee. Apart from a rare opportunity to return, however briefly, to my home continent, the talks helped me to verbalize many of the things I have struggled to learn over the years of developing as a photojournalist. I know everyone in the Ruom Collective has dealt with similar problems on the path to creative success, and I wanted to give the students at Chattanooga State some advice on how to stay focused through the challenging days and years. Though there are countless topics and subtopics that could be examined in endless detail, the following five points touch on some of the hard truths I wish someone had told me when I was first considering a future in the arts. While our grandparent’s generation spent decades crafting meaningful careers for themselves, those for whom the internet has been a dominant presence in their lives (myself included) have become some of the most impatient people the world has ever known. We want everything to happen quickly, and with the minimum possible effort. The best and most honest thing anyone told me when I was contemplating a transition into full-time photojournalism was that I should expect to have to work for five years before I could count on getting regular work, and more like 10 years before I was able to make a decent living at it. As I will touch on in the next section, “decent” is a subjective standard, but the point is that all of us in creative professions need to stop quitting when things get difficult. The surest way to not accomplish your goals is to stop trying, and if we view our careers in terms of the long game instead of looking for immediate results, I think we are better able to judge our progress without getting frustrated. If you put enough good work out into the world where people can see it, good things will happen. A crow hops between ledges in a residential area of Rampur Hat. Journalist was recently listed in the Forbes top ten list of the most stressful job in the world. Anyone who has worked in the media will not be surprised by it’s inclusion - it’s a tough market out there - but the most striking detail about the list is the disparity in income between the various professions. Of the jobs on that list, only taxi driver and soldier had a lower median income. If you can earn more money writing copy for Walmart, why would anyone want to bang their head against the wall to get a good story? The answer must be that people in the industry think it is important work, and odds are they wouldn’t choose to do anything else, even if they could. The very best in any field (excluding possibly some in business and finance) are the ones who do their jobs because they love them, and would probably do them even if they weren’t being paid. By contrast, people who start out in search of fame and fortune (again, maybe excluding business or finance), often get discouraged and quit after a few years of spartan living. But the people who do their work because they care about it, these will be the people who eventually excel. After all, there are plenty of stressful jobs out there, so if your primary motivation is money, then there are at least seven others on the Forbes list that pay far better. 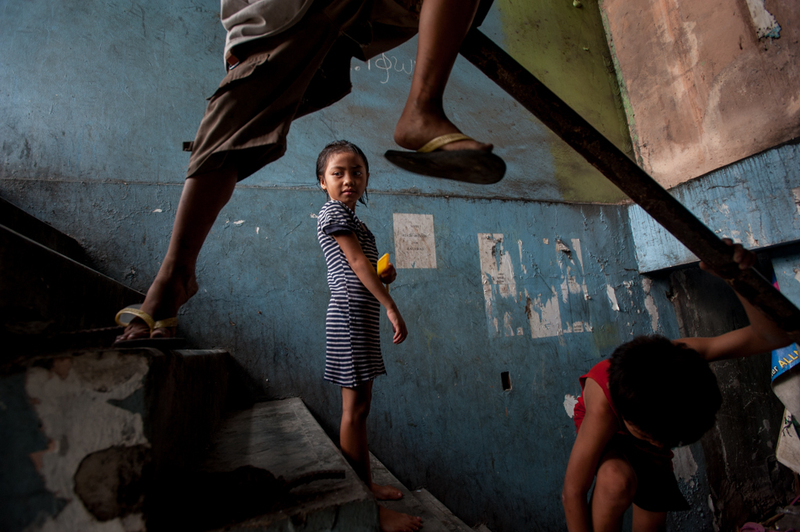 Angelica, 8, plays with her siblings in a stairwell next to her family shack near the Osmena highway. Manila, Philippines. Part of a larger story about escaping the poverty cycle in the Philippines. Since 2007, when I started living more or less permanently outside of Canada, I have been able to attend precisely one family event - Thanksgiving, 2013. Sure, I’ve seen my family many times over the years when I am home to visit, but the big days - Christmas, birthdays, anniversaries, etc. - I’ve missed them all. And while I’ve gotten quite good at being self sufficient and living on my own, this still bothers me in many ways. This has been one of the biggest sacrifices I’ve had to make, and one that has been absolutely essential to the growth of my career. By moving overseas I was able to live on far less money, and therefore reinvest my free time and capital into the betterment of my skills. As time goes on and I become more financially stable this is changing. But even if I was able to fly home whenever I felt like it, wouldn’t have gotten this career off the ground if I hadn’t been willing to give something up. The world’s success stories are almost always full of personal sacrifices. From the A-list movie actor who worked at Starbucks for 10 years waiting to get that first big break, to the prolific novelist who lived in virtual poverty because they refused to give up their craft, the people who do whatever needs to be done to keep themselves in the game are the ones who come out on top in the end. A tree planter works an especially good piece of land and will go on to make over $700 in one day. As the season progresses and planters will push themselves to make as much money as possible before the contract finishes. Alberta, Canada, 2013. Part of a larger story documenting a four month tree planting season in Northern Alberta. Marketing theorist Seth Godin said in one of his books that if your job can be taught to another person with an instruction manual, on a long enough timeline you will, without a doubt, lose your job. Take a look at the near catastrophic fall of American industries and the trend becomes clear: whoever can do it cheaper and faster wins. Godin argues that the only sure way to count yourself safe in the modern global economy is to become irreplaceable by making sure you bring things to the table that few other people can. For generations, and really since the beginning of the media industry, it has been predominantly journalists from wealthy countries that have been entrusted with telling the world’s stories through the news. Now, however, the playing field has been substantially leveled. GMB Akash, my friend and celebrated photographer, told me that when he decided to become a photojournalist in Bangladesh, he was told it was an essentially impossible pipe-dream. But now, some of the most promising talent in the field comes out of Bangladesh. At last year’s Angkor Photo Festival it seemed as if every other presentation was from a Bangladeshi - and it was all fantastic work. Aspiring photographers all have an unprecedented access to high-quality, low-cost equipment that allows them to produce complex multi-media stories with more ease than ever before. So does everyone else in the world. Those who hold onto the hope that a degree and a macbook pro will be their ticket into a competitive field are the most likely to quit when they realize that kids in Bangladesh have been devoting their every free moment to their craft - and are much, much better at it than they are. Ultimately, those who do something for the right reasons, put in hard work, and stick out the tough times, are going to become irreplaceable, not those who try to buy their way in. A monk outside his pagoda in Phnom Penh, Cambodia. Part of a larger story on the recent trend of Buddhist monks entering the political sphere in Cambodia. Maybe the most cliche piece of advice currently in circulation, but it holds true. Yet at every public speaking event I take part in, the first question asked of me is always “what kind of camera do you use.” I would love to go on a self righteous tirade about how photography is all about art and the camera is irrelevant, but since I too find it hard to escape gear lust, I am in no position to pass judgement. Nice gear certainly can make your life easier, but not if it comes at the expense of actually going out and making things. Imagining that a new camera will improve your work more than the act of going out and shooting things is a recipe for financial disaster. For the cost of a high end DSLR and a professional grade lens, you could probably buy a ticket to Nepal or India or China, or any number of places, and live there for six months. The constant exposure to new languages, cultures, religions, and food, combined with the fact that you don’t have to work for six months, will directly improve your work more than a full frame sensor ever could. The point is not that gear is unimportant - quite the opposite. But the desire for new technology has to be weighed against real need. A friend of mine is one of the chief videographers for Cambodia’s largest English language newspaper, and he has been producing news-quality work with a camera that can be bought for under $350 on Amazon right now. I’m sure he would be thrilled to get a new camera, but he is too busy working to think much about it. Does your organization’s staff need camera training before going into the field? Do you have a story or cause that needs media attention? Do you want to learn how to take more insightful photos, or how to craft stronger documentary photoessays? For more information on how the Ruom Collective can help you with your media-related needs, write to us at info@ruom.net to learn about Ruom educational seminars,public speaking events, and photography workshops. Longer versions of these posts can be found at www.lucforsyth.com/blog.